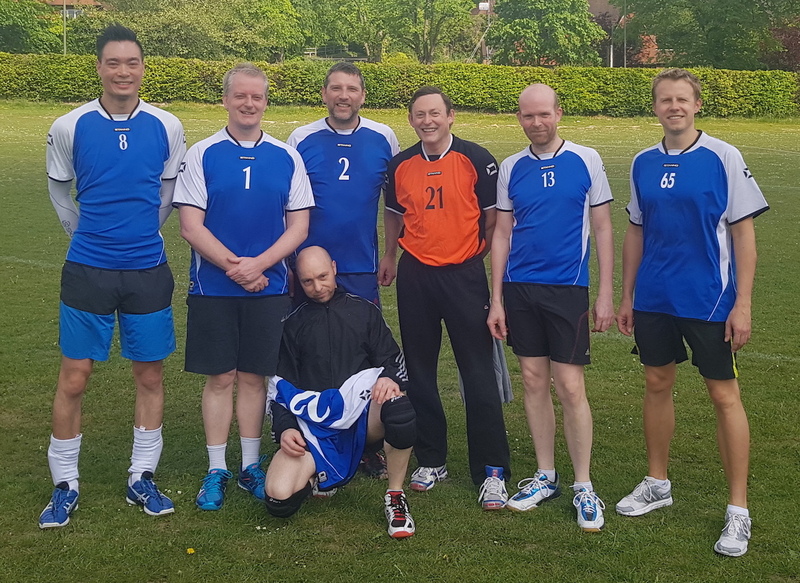 Having finished in 2nd place in the Surrey League Division 1, our MVV 1st team had qualified to play the SEVA tournament in Ashcombe on the 13th of May, competing against the top sides from Surrey, Sussex, Hampshire, Kent and Berkshire. It was a fabulous day with dry weather and sun shining happily - not that it mattered as we were playing indoors. MVV started with seven players and all arrived on time, we reckon that should have been a point for us already! It was the best of three sets and first to 21 points and it was going to be fast paced games. Our first match was against Brighton Wolves. We started the first set with confidence. A number of good series of receives, sets and attacks saw us leading the first set. Unfortunately we lost the set narrowly 21-18. Substitution was made for the second but again we lost the set and match narrowly 21-19. Knowing how unpredictable British weather is we snuck outside and took lovely team photos, while we still looked fresh and fit...ish. The second match against Farnborough went much better. MVV played and fought hard, working really well as a team, and deservedly took the match 2-1. With refereeing duty over MVV played the bright orange kitted Maidstone. We sailed past them in the first set. A close second set followed but we got past them. Our future is brighter than theirs as we therefore qualified to play the semi final knock out stage. The semi final started at 16:15 against Maidenhead, the first placed team from their group stage, with one formidable new player. MVV fought hard once again but the match was dominated by that one player, and MVV lost 2-0 which concluded the 2017 SEVA tournament for us. In the final Brighton edged the deciding set to beat Maidenhead 2-1. The day was thoroughly enjoyable, and we thank the organisers and Ashcombe for running another great tournament.